"The Spill & Fill Policy currently being implemented by the Telikom PNG Management is not applicable in PNG, it’s not a law and its illegal." This is according to the General Secretary for PNG Communications Workers Union, Mr Jeffery Borari. He says the only legal document binding both parties is the Enterprise Bargaining Agreement. "The Spill & Fill policy should be done a away with or completely withdrawn," said Mr Borari. He has pointed out that the 300 plus employees of telikom who were removed from their employment due to this policy will have to be reinstated and CEO Michael Donnelly and Chairman Mahesh Patel must be sacked, suspended and investigated. "We the Union will petition the Prime Minister and this is one of the first agendas or action that we want the PM to take when responding to our pettition," Borari said. Furthermore, Mr Borari pointed out that in support of addressing this issue, five (5) workers unions, namely PNG Communications Workers Union, PNG Energy Workers Association, Maritime & Transport Workers Association, Air Niugini Employers Association and Bankers Employers Association have combined to resolve issues affecting their members at their workplaces as well. "The coalition union have had serious meetings in the previous weeks which we will have our resolution brought forward to the Prime Minister anytime this week." 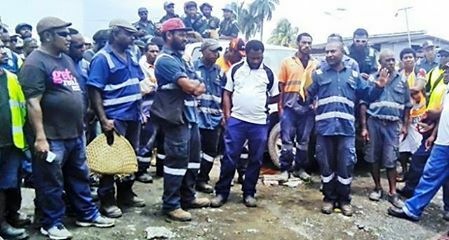 Borari said that the employees of Telikom PNG & PNG Power have been fed up with delays and unkept promises by their management regarding issues affecting them at their workplaces. This has prompted their workers union and associations combined with other three workers association to plan for a revolt against the government of not hearing their voices of concerns. "Many hardworking staff of Telikom, PNG Power, Air Niugini and other organizations both public and private have had their rights deprived by management of the organization they work for and this has to stop," said a frustrated Borari. He said its a good thing to have all workers union come together for a good course in addressing outstanding and stressing issues affecting their members.